Sometimes an episode of television airs and you just really need to discuss it with multiple people. That's what happened when The Mindy Project aired its most recent episode which was a seemingly innocuous farewell to Peter Prentice... until the final thirty seconds of the episode. SPOILER: Dr. Mindy Lahiri is pregnant, as confirmed by Peter. And while a vast majority of viewers celebrated the idea of a Danny/Mindy baby, Ann (your regular reviewer of all things The Mindy Project), Jaime, and I were not as enthralled with the idea of a pregnant Mindy on the series. So its with hesitancy and with skepticism that the three of us entered into our discussion today. We talk about the series as a whole and what it does right, that not-so-shocking game-changing ending, and what this means for the future of The Mindy Project as a series. First of all, before we dive into the episode itself, what do you think have been the strengths of The Mindy Project this year? When the show is good, why is it good? Jaime P.: I think the strength of the show has always been in how these very specific character interact and co-exist. Everyone is so unique in their quirks and flaws, but what makes the show great is watching how everyone navigates each other's quirks and still manages to care so deeply about each other. So going into a third year of writing these characters, I think the writers know them extremely well, and know how to create that balance where the characters can still be funny and quirky and crazy without tipping over into seeming like a parody of themselves. Sometimes on television, magical things will happen accidentally, just by pure luck or by the strength of the actor(s). Then the writers try to force that magic, but in doing so, they lose it, because they're trying so hard to recreate something that functioned so organically. I don't think that's a trap the Mindy writers have fallen into - they keep all the characters true to themselves, and in doing so, they've created so much comedy just from putting these characters together and letting them interact. Like, I think one of the biggest joys of the show is just in watching these characters exist, and that's something that a lot of comedies lose pretty early on in their run. I think one of the other great things about it is how unabashedly it embraces emotion and connection. It doesn't take the time to build things up for you; like, my go-to example is always Mindy and Casey, and how they were together for like seven episodes. But in those seven episodes, you don't doubt how serious they are about each other, you don't really question whether or not they're moving too fast. Mindy casually says that she loves him in season one, in a way that implies it's not the first time. The show's not interested in telling you why these characters care about each other, or how it happened; what's important is that they care, period. So in doing that, especially in terms of the friendships on the show, it allows for a much deeper view than we might otherwise get. Like, Jeremy and Lauren dating behind Peter's back is obviously so much more painful than just a coworker sleeping with your girlfriend; it's one of Peter's really good friends. And that's just heightened with Mindy and Danny being together this season - they're able to have conflicts on a deeper level than any most shows can when their lead characters get together, because you can just trust that they know each other so well, so it allows the writers to dive in headfirst. Jenn S.: You know, I think you're right when it comes to The Mindy Project and the specific quirks and tics that each character has. Mindy Kaling and the writers have done a great job at ensuring that every character has a unique voice -- that jokes aren't interchangeable; something is only funny if Peter says it versus if Jeremy or Danny says it. A lot of shows try to make their jokes so generic and it just makes the comedy of the series flat when you do that. It doesn't make everyone have a real voice. And I think a lot of the reason that this show has succeeded is BECAUSE of that: because the writers make the conscious effort to devote time not just to characters trading jokes, but for them trading scenes and toeing that line between hilarious and heartfelt. And you're absolutely right: a lot of the joy of good TV is just watching characters interact with each other -- in seeing how they clash and bond. Like, I absolutely love what the show did with Mindy and Peter. They took a character -- an outsider -- and integrated him so seamlessly and well once they realized he needed to be with someone like Mindy who could (on occasion) also be insufferable. The two really balanced each other out with their quirks because neither had the SAME kind of quirk, if that makes sense? So it worked. Mindy was Peter's confidante and friend; Peter was Mindy's advice-giver and sage. In terms of the balance between emotion and comedy, I think that it often does a good job at leaving the most emotional moments out of the punchline (like Danny breaking up with Mindy, Mindy crying at the door over Casey, the reveal at the end of this episode), which is something a lot of other comedies often do. And it causes the emotion to suffer because of the integration of a joke -- it undercuts the significance of it (I'm thinking specifically of shows like The Big Bang Theory). And when it comes to the inclusion of emotion in storylines and with these characters, The Mindy Project usually employs the "show-don't-tell" method quite well and also manages to, as you said Jaime, not overextend the drama or focus on the build-up of some emotional event. Ann S.: I agree with what both of you are saying about the specific voices of the characters and the joy in watching these characters and their relationship dynamic. In particular I'd like to point out how the show has succeeded this season with regards to its two major relationships: Mindy and Danny's romantic love and Mindy and Peter's deep friendship. I think when it comes to Mindy and Danny the biggest success is that they haven't become unrecognizable; some traits of theirs may have become exaggerated but their edges certainly have not softened. And truly, I have been impressed with the type of banter that Mindy and Danny are still able to have despite being comfortably together... I think the worst couples on TV are the ones who change their entire personalities once they get together, and no matter my concerns with the Mindy/Danny relationship I don't think they are an amorphous couple blob. Danny and Mindy still clash and their best scenes this season IMO have been where they are challenging each other, such as their fight in the first episode of the season ("Why do you have so many secrets? You're an OBGYN, you're not Batman!") or their episode-long argument about Mindy's kiss with Jean that culminated in a brilliant, dramatic show ("And that is how it's done"). There's still so much potential with Mindy and Danny and I think the skeletons in their closets are still rife with material to explore who these characters are and why. As for Mindy and Peter, I really will miss Adam Pally's influence on the show. The #3 position has been fought after by Jeremy, who will hopefully find a stronger voice without Peter, and by Morgan, whose voice is a little too strong and hyperbolic for that spot. Peter Prentice was the best option: he was dumb and fratty, but the writers (and Adam) were able to mine some actual emotional substance from the guy. The best spot for that emotional substance was in his relationship with Mindy; it was the type of relationship that helped both to grow. Danny points out that with S&A Peter has turned from an unemployable pervert to an employable pervert, but it is equally true that before Peter, Mindy was in a far worse place than she is now. Danny is Mindy's true love and Danny and Mindy will help to better each other, but there's something about Peter and Mindy's relationship that is impossible to replicate. One more thing about this season: the way Beverly, Morgan, Tamra, and Jeremy have been used is the best of the entire series (not too much Beverly or Morgan, a little bit more of Tamra and Jeremy). I hope we get to see more of TJ and Tamra too! JS: "I think the worst couples on TV are the ones who change their entire personalities once they get together." I agree with this statement SO much, Ann. I hate when writers refuse to acknowledge the very traits that caused characters to get together in the first place for the sole purpose of creating conflict. Like, that's just bad writing. And I do appreciate the fact that The Mindy Project continues to remind us that Danny and Mindy are different people and they're not going to be completely changing who they are, fundamentally, even when they're a couple (a fact that Danny essentially states in this episode). Little changes are great because I think everyone changes a little in relationships, whether romantic or platonic. So change IS a necessary part of evolving a couple on television and Danny and Mindy definitely have a lot of sources of conflict to explore. Ann, you're so right when it comes to Jeremy and Morgan's voices. Morgan... look, I love Ike, don't get me wrong. But Morgan is very much of a caricature in the way that I found Britta Perry to be in later seasons of Community and where I think Nick Miller on New Girl dips into occasionally. Like, sometimes you look at him as a character and go: "Surely there is no one who actually exists like this." So when he's in a story with Danny who is, for the most part, the "straight" man of the show (unless Jeremy is present), it works because you have a balance there of their characters. Morgan is very strong and he needs stories where he's more toned down, while Jeremy needs MORE stories. I just want to know more about him and not in passing remarks like his conversation with Danny in 3x14 about his mother and father leaving him, you know? JS: Okay, so let's dive into the episode itself. I know all three of us feel like the end "twist" is problematic for the series, potentially, moving forward. I don't want to say that it has spelled doom and given the history of pregnancies on TV comedies in recent years (Rachel on Friends, Leslie on Parks and Rec, Pam on The Office, etc. ), I'm hesitant to believe that this story can work, period, let alone work well given The Mindy Project's current focus as a series. And, like, we can discuss this further of course but this is more unprecedented because The Mindy Project seems to have moved away this year, at least, from an ensemble series. It's become heavily focused on Danny and Mindy to the point where they pretty much always (can anyone think of an instance this year where they have not?) occupy the A-story. In the series I noted above, that was never the case. Rachel wasn't the lead of Friends so her pregnancy was a focus on the show but not the main focus of every episode. There were always five other main characters with five separate arcs and plots. Same with Pam on The Office. Parks did a stellar job at avoiding that trope altogether with the time jump. Kudos to Mike Schur for that one, really. So what happens when you have the lead on a show pregnant when the show was once an ensemble and suddenly became a couple series? I brought this up to Jaime last night, but if The Mindy Project was a show like Mad About You was, then this would work -- if the show had always been focused on a couple with a few friends as supporting characters, then a pregnancy would just be an added complexity to a story about a couple. But... that's not how The Mindy Project has operated. And throwing a pregnancy into a story about an already-shrinking ensemble means that the show is going to become even more Danny/Mindy-centric than it has to be. The pregnancy and the baby WILL be the main character and that's unavoidable. JP: Yeahhhhh, and it's exactly that focus on Danny/Mindy that makes me nervous about this baby storyline. They've had a storyline together in every single episode this season. And I mean, yeah, they got a lot of focus in season 2, but it worked because it was sort of an isolated set of episodes, and it was a specific run up to the finale. But now, everything is about the two of them. So it's not even that I just think this baby storyline is doomed to fail - it's just that if they handle it the same way they handle Danny and Mindy's relationship, it's going to be a lot to deal with as a viewer. If every episode has a storyline dealing with her pregnancy, or with the baby itself once it's born...the show is literally going to become Keeping Up With the Castellanos and a Lahiri. So that's really where my biggest concern lies. As a fan, I'm thrilled for Danny and Mindy to have a baby, and to see them become a family. But they need to do it in a way where it doesn't push out Morgan, Jeremy, Tamra, and Beverly from having a place on the show. And given how this season has been going, I just don't know if I trust the show to do that. JS: Well, and my problem is that -- again -- if it was a show that was the premise of JUST Danny and Mindy, that would be fine. But the title of the show is The Mindy Project. And if this is a project and something that needs to be seen through, the only way that you can truly better yourself is through community and by being around other people. That's what the first and some of the second season did well: it provided us with a well-rounded idea of who Mindy was. Now the focal point of the series is "Danny and Mindy" and really, the only way we're learning about Mindy is through her relationship with Danny. (And Peter but now that Peter is gone, that's out the window.) If you think about it, that's really what the series has become -- a show about a couple's relationship and their pitfalls as they try to work together and be together in a relationship. And I'm not saying that's BAD but it's what the show has become. And throwing a baby into the mix is going to make this show completely about them. I guess if that's what Mindy Kaling is going for, then fine. But it just feels... incomplete for Mindy to be so far removed from other people. To never have actual meaningful conversations anymore with anyone apart from Danny. And see my main problem too is that -- like we talked about last night, Jaime -- a baby is something you can't just forget about in a sitcom. Like, when both of the parents are on screen, you have to remind the audience that the baby is not there with them and then make reference to it or else the audience will look at the continuity and frown. A baby becomes a part of a show. Take Ross and Rachel, which was an example we noted above. The baby story worked better with them because Friends was an ensemble. So even if you had Ross and Rachel on screen together and a casual line from Rachel that the baby was at her mother's, that worked fine because it was a throwaway line and then the show could continue to be about a Joey/Chandler shenanigan or a Monica/Rachel story without much emphasis on the baby. But what you noted above and in your texts to me last night was that The Mindy Project has grown away from the "guy of the week" or "celebrity cameo of the week" story that it once was. If Mindy had a baby and was still looking for love, the focal point wouldn't be about that child -- it would be about her and x-storyline. But now that Danny and Mindy are together and happy, the baby story feels a bit misplaced simply because you don't really have a strong enough ensemble to prop up the rest of the show like you did with Friends. You won't be able to escape a pregnancy or baby A-story at the rate that The Mindy Project is going because do we really think Jeremy, Morgan, and Tamra are going to carry the A-story? No. It'll be Danny and Mindy and then maybe three minutes (if we're lucky) of screen time for the rest of the cast. Again -- is that what Mindy Kaling is aiming for with this big twist? Does she want the show to become even more centered on Danny and Mindy than it already is? Because then you have the problem of recycling conflict. What will Danny and Mindy's biggest source of conflict be once the baby arrives? Will their conflicts be the exact same as they are now, but just with an added child? AS: When it comes to the pregnancy, I agree with what you, Jenn, and Jamie are saying: hardly any other trope is doomed to failure as much as the pregnancy one. I will give the show credit in that there is a lot of reasons that this may not fail. Mindy Kaling said in a post-episode interview that she had been planning an accidental pregnancy or had had the idea in her head since season 1, and I believe her! I believe that there's especially a lot of comic material here in that it's two OBGYNs who are facing an accidental pregnancy, which is a little different from the norm. So to answer your question, Jenn, I actually think the one good thing about this pregnancy is that it may provide some clarity and focus to a season that has largely been recycling conflicts and A-plots episode-by-episode. There is a possibility for different types of conflict; it's impossible to say if the show will take that leap or not. Here's where I really am angry about the pregnancy, though: it is the wrong time. I am not talking about the fact that Mindy and Danny don't have all their affairs in order or about the fact they haven't moved in or been engaged to each other yet; I'm talking about how the set of problems that come with a little one on the way are inappropriate for what this season has done so far. What do I mean by that? Well, while watching this season I've been trying to put my finger on what the main arc is so far, or if there was any sufficient build up to anything to make me, as a viewer, feel fulfilled. 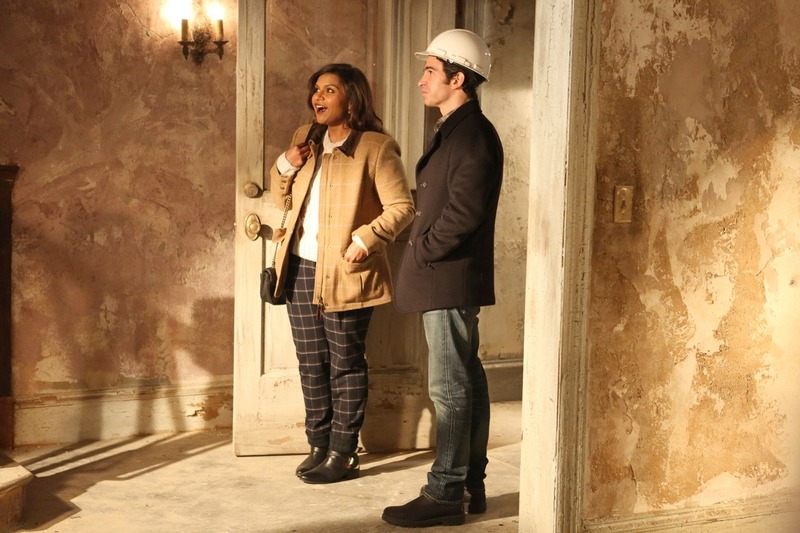 And there was a time within this episode that I felt that way--despite the (in my opinion) ridiculous 3-month time jump and Mindy Lahiri's assurances that she was "killing it" at the fellowship, I loved that Mindy and Danny hit an impasse regarding NY versus San Francisco. I loved that for how much these two bicker, the biggest obstacle to their relationship would be something very serious and legitimate, and that felt so real to me. And then the baby came. As both of you said, the baby just doesn't go away. It is a commitment on the show's part and, in turn, on Mindy and Danny's. So this cool conflict that the show had set up in the first 20 minutes of the episode was absolutely spent with the revelation that Mindy was pregnant. That will be the Trump Card; that will keep Mindy and Danny from being on opposite sides of the coast. It will bind them together as a family when there was so much the show could have done with Mindy's career, with Stanford, or with this idea of how much change is enough change. So in terms of conflict, Jenn (to try to bring it back to your question), I think I'm annoyed more than anything at what potential conflicts we've lost. It's spastic, and although (as the show reminds us many times this episode) life moves in large leaps, TV shouldn't be allowed to have this many gaps in logic and use that as its justification. It's a cheat. JP: I think, given its premise, The Mindy Project is maybe a little more capable of sort of changing its focus than most other shows on television. Because really, what is the premise of the show? If you sum it up in one sentence, what would that sentence be? I think it would be dramatically different now compared to what that sentence would be if you came up with it in season one. The show has gone from focusing on Mindy finding love to Mindy making all of these great things in her life work. And like you said, the idea of Mindy herself being a project is, I think, what fuels those changes in the show's premise. She works on herself and once she finds resolution in a particular aspect, she can move on to something else. So where the show used to be a boyfriend-of-the-week/problem-with-boyfriend-of-the-week type of thing, it's now complication-with-her-serious-boyfriend of the week. So it's not that I don't think the show is capable of adjusting to how its characters have changed in the last three years. Actually, I think it's one of the few comedies that actually looks at how the characters have changed from their initial inception and embraces who they've become. So I do think it's possible for them to take that Friends or Parks approach to the main character having kids. I mean, if Danny and Mindy are at work, it'll be obvious that they have some sort of daycare/babysitter, okay, that's a very normal thing, that's not something they need to address. The problem is going to lie in moments when they're NOT at work, which I think are either going to become over-baby-saturated or, conversely, have zero mention of the baby in an attempt to keep it from taking over the show. And I think doing the latter can work - that's what Friends and Parks did, that's what happened on The Office to a degree with Jim and Pam's kids (moreso their second child than their first). But the thing is, all of those shows were late in their runs when characters had kids. I mean, no one knew exactly when Friends would end when they decided that Rachel would be pregnant, but it was its seventh season finale. Jim and Pam's kids were born in seasons six and eight. And while I don't necessarily think a character having a baby needs to be something that's pushed to the end of the series... I just don't think season three is a good time for Mindy and Danny to have a baby. There's just way too much story with the other characters, even with Mindy and Danny themselves, to be explored. Looking at interviews she's given, I think the intention of Mindy being pregnant was to twist things up, and to make Danny and Mindy's lives complicated beyond just relationship hiccups of the week. So, okay. An attempt to move away from that could be good, right? It could mean that the writers are aware of what the show has become, and that they want to widen it up again. I agree with Ann in terms of what conflicts this could bring up - it's going to create new storylines that we haven't seen before on the show, and even if episodes are focusing on some Mindy/Danny conflict (like every episode this season has been), it's going to be different because it's no longer "Mindy and Danny might want different things at this point". He bought her a brownstone. They're having a baby. They're both committed, neither of them are going anywhere. And while that's been obvious for a while on the writers' part, that Mindy and Danny aren't going to break up, creating real roots between them on the show, having real, tangible evidence that you can point to and keep in mind if they're bickering or fundamentally disagreeing on something, it adds another layer to their relationship. It's like Jim and Pam's arc in the last season of The Office - it was good conflict because it felt so real, because you know exactly what emotional investments they had in each other and in the side they were arguing. That same feeling can apply to Mindy and Danny, and if it's explored right, it can make their storylines of the week feel like more than "storylines-of-the-week". I do think, in terms of the Stanford storyline, it was interesting how they set it up. It's not like Mindy doesn't have the opportunity to do something she loves in New York, you know? It's not as if by staying in New York, she's choosing love and family over her career (and I loved that Danny was part of Bob's plan to set up a practice. There's no love vs. career whatsoever here - Mindy never considers staying in Stanford by herself. The conflict is that Danny wants to stay in New York, which means Mindy has to convince him to go to Stanford). Obviously it's a big opportunity, one that she wants to take, but I appreciate that, while this pregnancy is bad timing (in terms of Mindy's life, not in terms of the show as a whole), it's not as bad as it could have been. The fact that this fellowship just kind of happened makes it totally possible that Mindy will come across great opportunities again, and I feel like they're only going to get better and better. Her career is not going anywhere, but its vitality means it can only go up. It's not going to stay stagnant, baby or no baby. And looking at what Mindy Kaling said and some of the upcoming episode synopses, it doesn't seem like San Francisco is being dropped. Which is great - they're not letting the baby dictate the storyline (because it would be so easy to go, "Well, we gave Mindy this conflict between New York and San Francisco for the sake of giving her a great conflict, but now she's having a baby, so ultimately, we got to do this big thing without having to commit to it). Obviously the baby will be some sort of factor in what they decide, but they're adapting around the conflict instead of the other way around, which is how it should be. And if that's how they handle the baby storyline, then I'll be okay with it. Just...they need to commit to doing it well, rather than just commit to doing it. JS: Jaime hit the nail on the head (sorry for the cliche, but it's true) when she noted the timing of the Friends, Parks, and The Office babies. The reason that I think this pregnancy story could be jumping the shark if The Mindy Project is not in its final season is because it seems like something that would not have actually been a risk they would all take if the show would not be close to potentially ending. I mean, think about it realistically: I know Mindy talked in that interview about having the idea of an accidental pregnancy since season one, but that was before Danny and Mindy were even on the radar as a possibility. Okay, in season one and seasons two, a pregnancy would not have worked. But I don't feel it works in season three, either, simply because if this show were to have a guaranteed five seasons, Mindy would not be pregnant in season three. The whole idea of "jumping the shark" is really boiled down to doing something dramatic for the sake of being able to do it and potentially NOT being able to do it later. If Mindy knew her series would be five seasons, there would be no point to having Mindy pregnant in the third season. I just don't believe she or the writers would do that. And I think that the reason the FOX executives are okay with this story is because they know the series is drawing to a close. This is Mindy's third act and if the show is going to end after this year and not get renewed, then the network wants it to end with some sort of full-circle resolution. The project being completed, as it were. Jaime is right in that all of those other series were so established in who their characters were that a pregnancy worked. Parks' in particular worked well because even though Leslie was pregnant, we weren't subjected to the trope of the pregnant woman having cravings and being hormonal, etc. Ann's pregnancy on the series worked well because she wasn't the main character. And that's the distinction, really. But you're both right in that this baby is going to be a source of conflict. Putting the two of your explanations together, it's easy to see why from a writing standpoint, I'm having a hard time grasping the idea of this pregnancy -- because no, Mindy isn't going to be torn between work and raising a family, as Jaime noted. It's going to be a matter of where they're going to do it. And the trope of "woman has to worry if man will abandon her once she announces her pregnancy" is also not true in The Mindy Project's case: we know that Danny won't do that. So then that brings us to Ann's very well-made point: what kind of conflicts have we lost in that process? As much as I don't want The Mindy Project to become tropey in utilizing the conflicts I noted above, they've also lost two very large sources of conflict. And no one wants to see Danny and Mindy have a wonderful, perfect life on TV. Viewers thrive on conflict because without it, there's no real story. You're just watching a glorified version of a heart-eyes GIF set on Tumblr. Again, a lot of this is speculation since we don't know how the show will continue to develop the story. But I worry because so few series have been able to pull off the trope of an unexpected pregnancy WELL and all of them that I am aware of have had more advantages/supportive ensembles than The Mindy Project has currently. JP: I said this before, but I want to reiterate it because it's definitely the biggest thing I'm feeling in regards to this storyline. Is The Mindy Project capable of changing? Yes. Is it capable of juggling multiple storylines and letting its focus stray outward? Yes. Does a baby necessarily equal death? No. But the problem is, I don't trust these answers because none of them have been consistent enough to make me confident. I talked about a few different ways that this storyline could potentially work, but they're all ifs. It could work if they do it like this, or if they change this aspect. And there's just no way of knowing how big of an if any of these situations are. And I mean, you could do that with anything - any failed storyline could have worked if this one thing had been done differently. I think this storyline will only equal death if they let the baby, and thus the Castellano-Lahiri family, become the show. And I just can't tell how likely it is that that situation won't happen. JS: Jaime's exactly right -- the biggest problems right now that I have with the story are the caveats -- "I can see this working IF." And my hesitancy to embrace the story is really based on that uncertainty: that I cannot definitely say that the show is in a good enough place where this would be good for it. And that's why so many shows have pregnancy stories that are the kiss of death: it's good on paper and then the further you delve into the story, the more you realize it's not. This could be something great for The Mindy Project -- a resurgence of sorts -- or the kiss of death. But right now I can't say that it's a good thing because there's not enough evidence to support that this show is ready to fully tackle that story without a threat of failure. So that's really why I'm not thrilled with it, honestly. I can't definitely say that it's going to help the show as a whole more than hurt it. AS: I would say that my bad feelings about this new development stem from WHY I think the writers did it. I always gushed about this show because when things happened, it didn't feel inorganic for them to happen. As I said before -- you can't just use the "life moves in leaps" logic to justify storytelling that moves in leaps. It's contrived and not well thought out. It's: "Ooh, I'd like to see some pregnant Mindy shenanigans!" over "What is my character dealing with right now, why are they dealing with it, and what does that mean for their future?" I cannot reconcile in my head that the sudden turns of this episode are justifiable -- I mean, in this episode three months passes by*, and this is the first episode where Adam Pally's departure (or Tracey Wigfield's!) is mentioned. It is arbitrary. It is bad storytelling. In this episode of The Mindy Project, Mindy says about San Francisco: "It's beautiful, and it's inspiring, and it's made me my best self. I'm a better leader, I'm kinder..." And then everyone starts booing, to which Mindy says, "Shut the hell up, trash!" This is how I feel my relationship with the show is going: it's telling me, not showing me, how much for the better the characters and the plot are; I resist; and they march forward anyway with a "screw you" attitude. As someone who has watched this show ardently (check my iTunes play count if you don't believe me), I am so disappointed with this show because for all of the deliberate foundation, for the "little step" mentality that capped season 1 with an "almost" instead of a kiss, this is what I'm getting instead. It's a palatable, comfort food show, but with this new turn it has not just made a mockery of my expectations for this season but for the series in general. I did like "April, Come She Will," though. * According to the timeline of this show, Peter and Lauren kissed three months ago. Why haven't they started dating sooner? Did we just have to assume she didn't break up with Jeremy but was pining over Peter? They definitely didn't keep it going because Morgan only confessed to the kiss and Peter didn't elaborate. Not that any of this matters. Who cares about details anymore? Why is this a roundtable? The better question is... why NOT a roundtable? Simple answer: We were having a group text/tweet conversation and we decided that the best way to do so would be through a roundtable about the episode. It's funny because I don't see explaining where the baby is being an issue at all. It never occurred to me that the show would be all or mostly about the baby. Of course, they'll have a nanny. Mindy already said she would, and the show is about affluent doctors. Before they got together, 75% of the show took place at the office, and I'd think it was reasonable if we literally NEVER saw the baby there. When you look at a show like Modern Family, where Jay and Gloria had a baby 2 seasons ago, they established that they have a nanny, and the only time you see the baby is when the episode is specifically about the baby. I do agree that it's ridiculous that Peter kissed Lauren three months ago, and then nothing happened. Otoh, I never really cared about Peter and Lauren. If they Gwen Grandy'd Lauren, I'd be fine with that. I think... that was kind of our point though, too. Why introduce a baby story in order to sideline the baby? Like, what is the importance of making Mindy pregnant if -- as you said -- the show will likely bring in a nanny and maybe we'll have one or two mentions of a child every few episodes and barely see the child? Just for the sake of needing conflict? See, that's just as detrimental as bringing in a baby and then making EVERYTHING about the baby because if that's the case -- if the child is introduced as just a plot point and we never see or hear much of the baby throughout the rest of the series -- then there's no point to the conflict in the story, except that it was just for the sake of conflict. And maybe that's the problem I'm having with Danny and Mindy being the main focus of this season: we're recycling conflict after conflict and it's what happened to Nick and Jess in New Girl, too: there are only so many stories the viewer can take about Danny and Mindy clashing over their personalities. And that's when shows bring in stories like marriages or babies but since we've dug through the marriage well already this season, their next viable option I guess is a baby. Which is fine, if the baby isn't going to just be used as a one-and-done source of conflict for the characters. If it can become an actual part of the story and mark growth, change, etc. in the characters that's one thing. But I think the point we made above for us is that the show hasn't really proven that it could take this baby story and handle it well. Time will tell, but it's interesting to contemplate at least.